When considering a new natural gas grill for your patio or outdoor deck area, the Lynx L27PSR-3-NG Built-In Natural Gas Grill with Pro Sear Burner and Rotisserie is a top-rated choice. The grill provides a number of components that easily creates an unmatched outdoor cooking experience. The quality craftsmanship of the grill is visually pleasing while the innovative features help you to prepare your favorite grilled foods with ease. Grease and moisture are avoided as this grill is created from high-grade stainless steel that was seamlessly welded for maximum performance. You are sure to love the style and function that this grill can provide. Lynx created this 27-inch grill with the inside and outside components configured for quality and style. A unique design was used on the exterior shape to allow the grill to deflect the wind for maximized cooking temperatures as well as allowing the grill to have correct venting. With this design, the much-needed surface temperatures are reached, even when the weather outside is less than pleasant. While the outside was designed well, so was the inside. A 23,000 BTU infrared burner that offers adjustable settings was added so that you can cook even the thickest cut meats to perfection. You can turn back the temperature with ease as well to cook thinner or more delicate meals. A 25,000 BTU cast-brass burner was also added to provide quality heat retention via the tube burners so when you check the progress of your cooking, the performance is not hindered. On top of the natural gas cooking elements this Lynx grill provides, grill owners can also take advantage of the smoker and rotisserie capabilities. A nice size smoker box was added within the design of the grill so that you can add massive flavor to everything you enjoy putting on the grill. The smoker is an added element that can elevate the way you cook anything from steak to hamburgers. The grill also includes an internal rotisserie offering two positions and that has a 3-speed heavy duty motor plus an infrared burner in the rear. This helps to provide additional cooking options for your rotisserie needs. The Lynx L27PSR-3-NG is not heavily reviewed at sites like Amazon, but the grill does have a high rating. Three customers at Amazon have rated the natural gas grill so high that it has a 4 ½ star overall rating. One five-star rating praised the grill on its workmanship, saying it was a ‘great grill’. Another reviewer pointed out the high cost but is worth the price if you love to grill on gas. The reviewer stated that the grill is easy to install and it gets really hot rather quickly. This is a good point to consider when purchasing a new grill as it will allow you to cook quickly, which can be beneficial when grilling. This reviewer even included photos at Amazon so shoppers can see how they installed the new cooker in their home. Some of the remarks about this grill include … “Five stars” … “Well made” … “LED lighting is excellent!”. In conclusion, the 27-inch Lynx L27PSR-3-NG Built-In Natural Gas Grill with ProSear Burner and Rotisserie is a nice addition to any home when you are an avid griller. Enjoy cooking in the great outdoors, creating a custom space where you can prepare your favorite foods via the grill on your deck or patio. Since this unit is built-in, you will be able to create a customized grilling space within the outdoor area of your home. Create a rock wall for displaying your new grill, with space added for food prep or serving as you see fit. With this grill type, you have the ability to create a customized space that you can enjoy cooking in as well as hosting outdoor parties and dinners with friends and family. With a built-in, you have the option to create a unique grilling space that is all your own. The only obstacle you may see with this natural gas grilling unit is the cost. At almost $3,000, the price makes this grill a hefty investment. 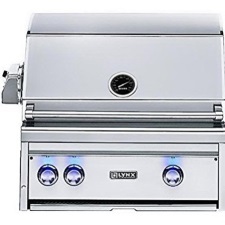 However, if you are a regular gas grill and want to upgrade your patio space to include a built-in grill plus smoker and rotisserie, then this Lynx grill is the right option for you.